Me: its your birthday in soon, what would you like? Sean, looks into the distance for a few moments: You know those fishermans jumpers in that exhibition. One of those. He is referring to a gansey and the exhibition was The Dutch Gansey exhibition at Sheringham Museum. I blink and do a quick calendar roll in my head. That’s four weeks. To order the yarn and knit a mansize gansey. I sort of physically recoil. Blink. Gulp. And say in a quakey small voice: Ok. I give him the Stella Ruhe book and tell him to show me what he likes. 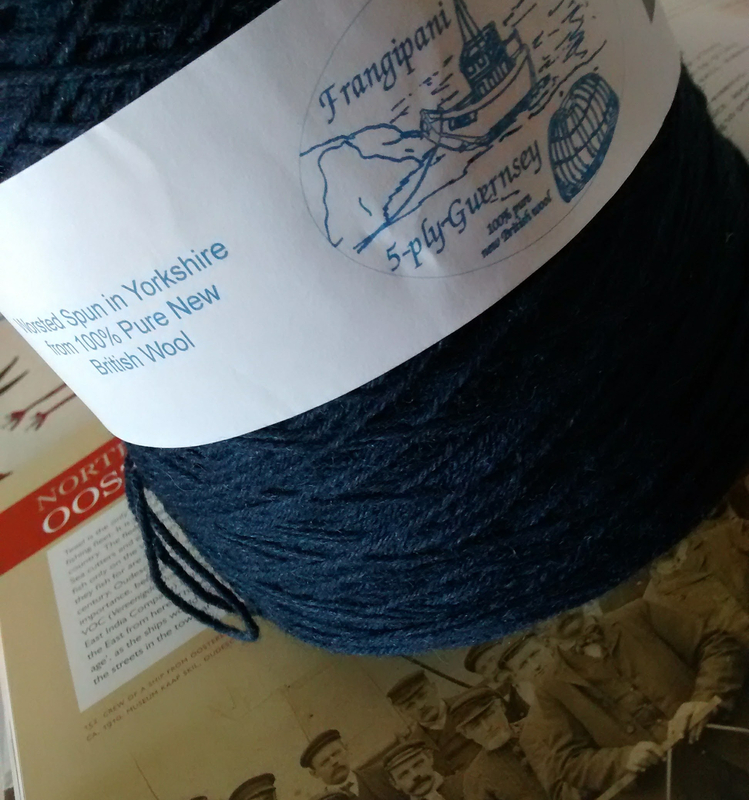 And then in a mad panic get myself online and order 2 cones of Frangipani yarn in traditional blue. Which thankfully arrived the next day. Thank you Gorgeous Yarns! It’s not the first time I’ve done this. 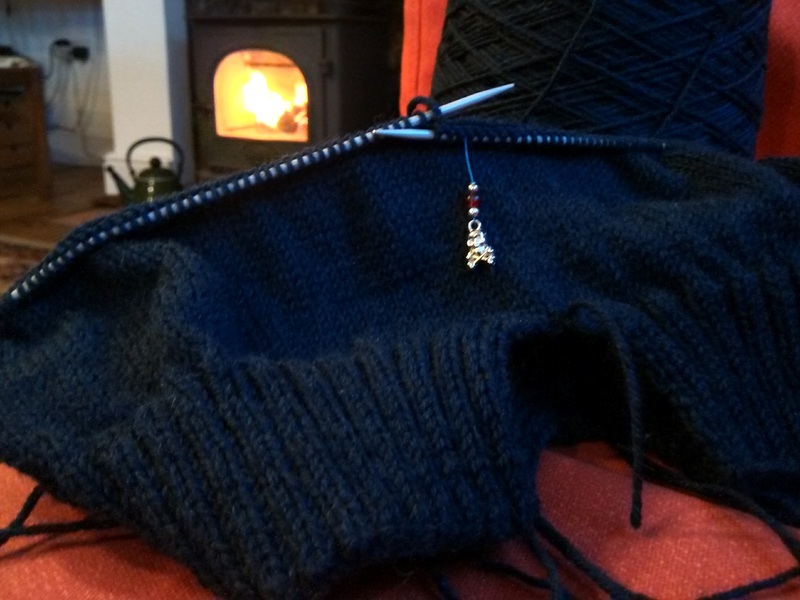 Setting myself a seemingly knit mission impossible. I do it all the time. If there is a special event I will always want a knit up the perfect shawl, wrap, cardigan, and jumper whatever. In the least time possible. Sometimes I pull it off. More often than not this will involve working later into the night that I ought to or getting up stupid early. On the bright side it’s about the only time when I’m grateful if I am having an insomniatic episode. I find myself getting a bit stressy with those I live with. And tears. Yes there are usually tears and tantrums. It’s not just spinning and knitting projects, I do it to myself all the time. Inventing a huge list of chores that need to be completed, or decorating/DIY project to be finished in time for a visitor or some other deadline. None of these things are actually important or even necessary. The world will not end. The sun will still rise and set. No one will think badly of me. No one will judge me a failure. Only me. I don’t think I am alone here. There are times when setting and accomplishing small stupid tasks can seem just as overwhelming. When the black dog dogs me getting dressed, leaving the house, making a phone call or sending an email can seem to be too big to deal with. But by setting a seemingly unachievable goal – even the trivial ones – will stretch me. And this is, generally, a good thing. Just trying to achieve that one thing can, if you pull it off, bring such a good feeling that is more positive than the self-defeating one of not even trying. Even if it does not go according to plan. I won’t mention those over achievers that make the rest of us feel bad. They are just ridiculous. Goals that stretch are good. Failure to reach them is OK. Not trying is not OK. Why are we afraid to fail? How do we learn or grow ourselves if we are so afraid to fail that we don’t even try. But I’m only talking about knitting. How silly. Or am I?